Private comprehensive school of sewing and fashion design in Calgary, Alberta, dedicated to teaching the fine art of haute couture sewing. Unique curriculum combining European haute couture techniques and 60 years of professional experience with originality of design, quality fabrics and perfection of fit and finish. Two year Certificate plus two year Diploma full-time programs offered in this specialized area, luxury niche market, in fashion to those with discerning tastes and creative ambitions. To fulfill the demand for highly specialized sewing skills in this luxury niche market of the fashion design industry. To respond to designers having difficulty in finding the expertise to create couture fashion with trained knowledgeable sewing professionals, particularly in the areas of pattern making, sample making and hand finishing, and to nurture exceptional talent in couture. 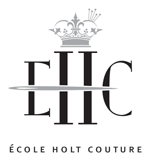 École Holt Couture believes that the mentor apprentice relationship, which is so crucial to the transference of very specialized sewing skills, has been lost to current fashion design education. The school therefore integrates theory with practical application, teaches techniques of design and pattern making; couture skills of precise tailoring and dressmaking and the embellishment of apparel and accessories as a specialization distinct from fashion design, marketing and merchandising. "There is nothing like the high you get when you see your clients experience the joy of falling-in-love with how great they look and how good they feel wearing a garment designed and perfectly made - just for them!". You will learn the skills to become the inspiration and creator behind the clothes, to express your artistic talent through original pattern making and garment design. "With its top-notch team of instructors, EHC is destined to become one of a few exceptional haute couture teaching facilities in the world". Concepts of fashion design developed through history are examined throughout the program, as well as the cultural implications that fashion has on society. As a student you will be with 5 other students in your class who also share your love of fashion and sewing, receiving a near exclusive private training experience under the tutelage of experience couture and training professionals, an opportunity almost unheard of in today's fast-track world. 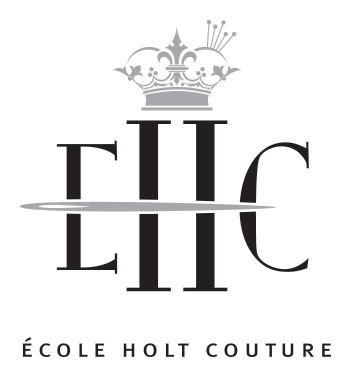 At École Holt Couture we strive to provide our students with an environment promoting creativity, as well as a structured learning experience, so they can achieve a level of professional craftsmanship excellence in this artistic expression medium of Couture and Tailoring.